The reality is that the name "Ganache" is off putting. It is a technique of softening chocolate so that it can be used as a filling for Truffles. Truffles are nothing more than Ganache that has been cooled down, rolled into a ball and coated with something so that you can handle it. Typically either cocoa powder or dipped in a standard mix of chocolate. Chocolate melts at 86F. You are 98.6F roughly. Chocolate melts on you. Ganache will melt faster. Chocolate Ganache is Chocolate that has been melted in cream in a 2 to 1 ratio. Pretty simple, right? If you reduce the cream, you get a firmer Ganache. If you increase it past 1 to 1 you get soup eventually. 2 to 1 is the ratio I see everywhere. First get a saucepan. I use a 2 quart saucepan. If you are Imperial Measurement Impaired think 2 Liters. Roughly the same. Fill the saucepan around 1/2 way and put a medium to low heat under it. You do not want the water to boil, a nice even warm is needed, maybe a little bit of bubbles forming on the bottom but more than that is overkill. While the saucepan full of water is warming, find a smaller saucepan that will fit inside the larger one. You will want that smaller one to float on top of the larger one and don't let the water overflow. Now, just what are you going to do with all this water? Melt chocolate. If you are using the stuff to dip cookies like in the picture, remember this is a recipe that gives you a higher moisture result that may make the cookies a little soggy so you'll want to serve them quickly or chill immediately after dipping. If you're going to make truffles, you will chill the ganache when you're done and use a melon baller to make the little balls to be coated later. Add to the small sauce pan 1 cup or 1/4 liter of chocolate chips. If you like the chocolate, you will like it as a ganache. If it tastes cheap, then get some new chocolate. Dark chocolate is best since you're going to be adding cream to it. Add to the chocolate chips 1/2 cup or 1/8 liter of heavy cream. The heavy cream is full of fat and will taste better than milk but I have used 2% milk to make ganache. If you don't tell I won't. Stir the chips and cream together until silken. Remove from heat and use for dipping or chill to allow for "balling" and coating later. Now "How Not To Use It". Simple, Ganache is not like your garden variety chocolate bar. It is silky and has a very quick melt since the added cream will allow the chocolate to be a softer consistency. Don't use it to dip anything you want to be firm and dry that may take up the moisture - like the cookies in the picture above. 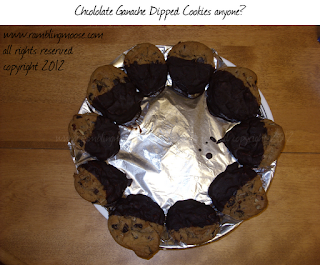 If you want to dip cookies in chocolate, then try just the chips in the method above. Leave out the cream. The other thing is that the ganache will find a way to get onto your hands since it has a consistency very similar to cake icing. I've used the ganache to ice a cake, and it takes some fiddling with the recipe to get it to work. The result is a very bold tasting icing since you're basically using dark chocolate to ice a cake. So if you're pressed for time, it took me about 10 minutes to get the ganache, another 10 to dip the cookies, and 10 to chill. Say 30 minutes total. Since Chocolate and Valentine's Day seem to go together perfectly, you're probably already late unless you've started. You may want to slip out and get a pound box of candy and skip the kitchen. Don't forget a card and maybe some flowers. Good luck, you're partner deserves it.